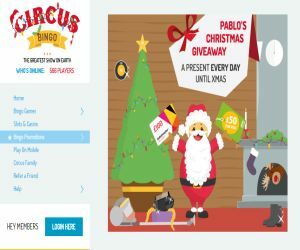 Circus Bingo' Christmas Giveaway | Win Daily Prizes! Roll up Ladies and Gentleman! As Circus Bingo is going to town this December with some extra nutty Christmas treats especially for you! In true circus style, Santa Pablo and his budding circus elves can't wait to help you celebrate in style throughout December! Actually, the crazy team have been working away all year to create some extra special luxury pressies and goodies for all their favourite roomies! Santa Pablo even grew a beard and a round belly and stuffed his grotto full of wild and nutty presents until the door popped! Luckily for you, this means that Santa's sack is stuffed to the brim with extra presents, and he needs to lighten his load! All you have to do to get in on the festive action is to deposit a minimum of £10 throughout December and you'll be in with a chance of winning super cool prizes every single day! The promotion runs across your PC, mobile and tablets. The nutty festive prizes range from awesome gadgets to FREE spins, bonus treats, plus an extra special gift for Christmas Day! If your still hungry for more, then if you deposit over £50 you can earn an extra 30 FREE spins, over £75 can earn you an extra 40 FREE spins. If you're feeling even nuttier and spend over £150, you can snap up a super cool extra 50 FREE spins., plus a cheeky mug! All you have to do is keep your fingers crossed as Santa Pablo will pick names out of his Santa Hat every day until 25th December! Santa Pablo still have a few monthly treats up his sleave, so make sure you keep rolling up to the circus for the £10k Dazzler on the 10th of every month, as well as Mystery Mondays and Freaky Fridays and more!